Q I am newly bereaved and would like to go on a trip to India, but am feeling nervous about doing this alone. Ideally I would like to stay at an Ayurvedic retreat, when it isn’t too hot, to detox after many months sitting at my husband’s bedside eating sugar and carbohydrates. Can you recommend anywhere? A It sounds like an excellent plan. I’d recommend booking a package with a specialist operator, to ensure back-up, and travelling between November and March, the drier season. You might consider a stay at Surya Samudra, a boutique resort with 22 rooms and a friendly place for solo travellers. 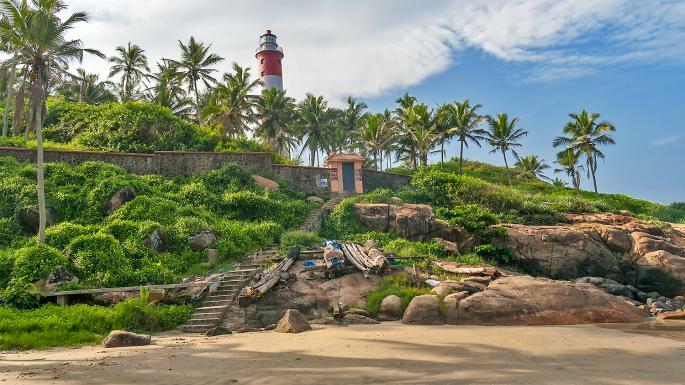 It’s perched on the top of the cliffs overlooking two white sand beaches just outside Kovalam, in Kerala, and all rooms face the sea. There are plenty of Ayurvedic treatments available, as well as yoga and guided meditations. A week’s stay starts at £3,250pp, based on single occupancy and including full board (healthy Ayurvedic meals), 90 minutes of spa treatments every day, yoga, and flights and transfers to and from Trivandrum. Book through the Healthy Holiday Company (020 8968 0501, thehealthyholidaycompany.co.uk). Alternatively, stay at Ananda, a spa resort in the foothills of the Himalayas. Wellbeing Escapes (020 3735 7555, wellbeingescapes.com) has a seven-night detox programme from £4,933pp single occupancy, including flights, transfers, spa treatments, private yoga, fitness sessions, fitness consultation and body composition analysis, unlimited hydrotherapy facilities and full-board spa cuisine. Q We are a family of four, with children aged 12 and 14, who would like to go on a sailing holiday with a small group in and around Croatia, followed by a week in a hotel. My husband has sailing experience and has taken a sailing and navigation course. Could you recommend specialist operators? A A Sunsail (0330 3321620, sunsail.co.uk) flotilla holiday would tick your boxes. The groups usually have up to 12 boats, plus a Sunsail lead boat, but you could sail on your own, or in twos or threes, and meet up with the others at the end of the day. A week’s Hvar itinerary starting at Marina Agana, near Split, costs from £3,590 this August for a two-cabin yacht. Flights, fuel and yacht damage waiver are extra. Sunsail could book you a hotel — the Concordia on the promenade in Trogir, for example — for the second week. Nautilus Yachting (01732 867445, nautilusyachting.com) and Seafarer Sailing (020 8324 3118, seafarersailing.co.uk) could also arrange flotilla trips for you. Q I booked a flight from Edinburgh to Barcelona with Norwegian in July with my sister. We have since been told that we will be flying with Orange2fly, a new Greek airline with one A320. I am on a budget and reluctant to change carrier, but my sister has moved to Ryanair at extra cost (although she will be refunded by Norwegian) because she does not feel happy with the substitution. Should I change my flight and is Norwegian doing this a lot? A Under EU law, airlines can “wet lease” aircraft with pilots and cabin crew to operate flights on their behalf. It’s very common and often done to boost their summer capacity. They have to inform passengers if a different company is operating the flight, but Norwegian, which told me it had hired Orange2fly because of a shortage of crew, is also offering rebooking on another flight or refunds if passengers are not keen on the alternative. All EU airlines have to maintain a common safety standard, but I’ve been unable to find any reviews of Orange2fly’s onboard service. I booked a trip to Indochina through STA Travel in Manchester. I couldn’t fill in the visa at Bangkok airport as I still hadn’t been sent details of my hotel. I was refused entry and had to wait for hours after phoning my mother to get her to call STA. When I finally did get through, there was no transfer as had been promised — I had to pay for a taxi. It was a traumatic start to my first solo trip to Asia and although STA has refunded the taxi fare, I don’t think this is sufficient compensation. An STA spokesman said: “Our records show that although the documents were sent from our systems twice before Miss Ward’s departure, these were not received. We are working with our IT service providers to discover the reason for this and to ensure that this does not affect any further customers.” STA also admitted and apologised that due to an error by the booking agent, “the transfer arrangements had not been confirmed” . You have now received a £25 refund for the airport transfer, £30 compensation for having to wait around and £100 as a goodwill gesture. You have accepted this, although you still think your complaint has not been taken seriously.